Both populations are present on Arran. Based on the records from the last ten years the migratory population from Iceland usually arrives between the 10 October and 20 October and departs again between mid-March and mid-April. The numbers of these geese vary but the maximum reported in each of the last five years was around four hundred and fifty. From the annual Arran Bird Reports stretching back over thirty years there is no obvious trend in population. This is a small number in comparison with for example the 35,000 Barnacle Geese which winter in Islay. The areas favoured by the migratory Greylags on Arran are the farm lands in the Shiskine valley and around Clachaig in the south of the island. The sedentary population on Arran, which is here all year round, tends to favour the land around Lamlash and Brodick in areas like Clauchlands, Glenkiln and Mayish. They have been reported breeding on Pladda. Over the last five years their numbers seem to have increased from around thirty in 2007 to around sixty in 2012. In the "Birds of the Island of Arran" by J.A. 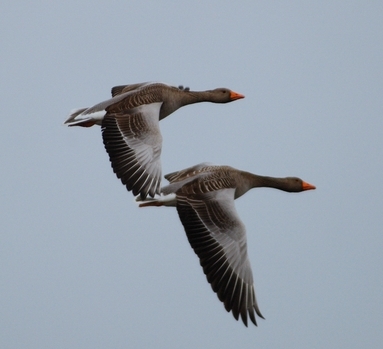 Gibson published in 1956 there is no mention of this sedentary population of Greylag on Arran. Records begin to appear in the last few years of the twentieth century. Where these birds came from is not clear. There is a long established native breeding population in Islay. In addition in the 1930s birds were released in Dumfries and Galloway for shooting. This naturalised re-established population spread into South Ayrshire in the 1960s and this may be the source of the sedentary population on Arran. From migratory birds that have fitted with individual labelled coloured collars, these birds do move during the winter. One collared bird in the Shiskine Valley was previously seen in Caithness and another in Ireland. The sedentary population also moves. For example they will go some where relatively safe to moult. Geese are flightless when they moult their feathers. Again from coloured ringed birds it was found birds moulting near Hogganfield Loch in Glasgow went back to Gloucester after they had moulted. Where Arran birds go to moult is not known.